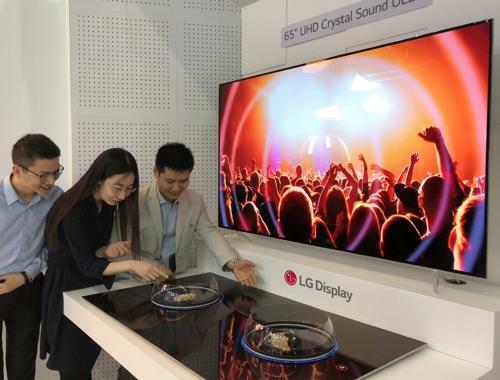 SEOUL, Aug. 30 (Yonhap) — The price of organic light-emitting diode (OLED) panels moved upward in the second quarter, a global market researcher said Thursday, a promising opportunity for LG Display to shake off its deficit. The average selling price of large OLED TV panels rose to US$712.50 in the second quarter from $695.50 in the preceding three months, according to IHS Markit. The panels’ price had reached $812.50 in the first quarter of last year but has been backtracking ever since to as low as the $600 level. The report forecast the price to climb to $731.90 in the third quarter. The recovery was led by the market’s mainstay 55-inch panels, whose price fell to $527.60 in the first quarter this year but recouped to $535 in the following quarter. The forecast for this segment is sustained gains until the end of the year. “The price of large OLED panels had continuously fallen from 2013. But recently, it is on an increase from demand outpacing supply,” a local industry official said. Related data showed shipment of OLED TV panels in the second quarter was 673,000 units, up 78.5 percent from 377,000 in the same quarter last year. Estimates for high-demand seasons in the third and fourth quarters were put at well over 700,000 units. Global makers of TVs have been turning to OLED panels, from LG Electronics and Japan’s Sony, Toshiba and Panasonic to European brands like Philips, Grundig and Loewe, fueling demand. Large liquid crystal displays (LCDs) have also been gaining in price after bottoming out. A 55-inch panel that cost $152 in June is now priced at $157. LG Display reported a second-quarter net loss of 300.5 billion won (US$270.35 million), compared to a profit of 736 billion won a year earlier. Some 42 percent of the company’s sales were in TV panels.